If you have ever tried making a bootable USB drive and aren’t, like me, proficient with computers, you have either struggled to figure it out yourself or used Google to find one of the many how-to’s that are on the Internet. Even then there is no guarantee you will succeeded. This is where Yumi comes in to the fray. 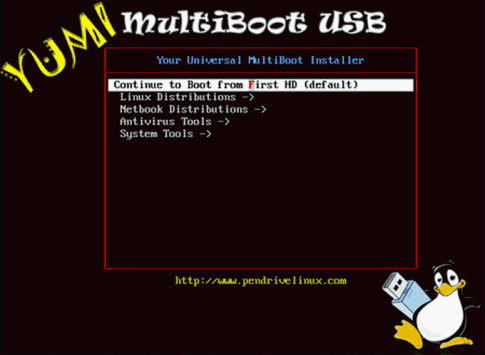 Yumi (Your Universal Multiboot Installer) is a one stop shop for creating bootable USB drives. It’s a simple application but it is very effective. Once the surprisingly small download of 887KB is complete you are presented with a very simple interface. It has options to select the USB device you want to make bootable, show all drives in the system, format the device and remove a previously installed operating system. There is also a list box that contains options to download – if necessary – and install pretty much all of the Linux distributions out there. As well as that, it contains offline virus scanning tools, diagnostics tools, disk management tools, windows installers any bootable custom CD image you may have. If you decide to download one of the options, it is downloaded using your favorite download manager or browser to a location of your choice. Once that is done all you have to do is tell YUMI where the ISO image is (if it doesn’t detect it), and you’re free to hit continue. The next screen is dependent on the options you picked. If you opted to format the device you will be given some warnings, if you didn’t it will go straight to the install phase. Not much you can really do here. The program will extract the ISO image to a temporary folder, marks the USB device as bootable and installs a copy of syslinux (which handles the initial OS selection) then proceeds to install the files from the ISO. All in all this is a very simple program, but it isn’t without its problems. Firstly, syslinux is ugly and doesn’t do anything GRUB (the standard boot loader for all the major Linux distro’s out there) can’t do, and since syslinux has to pass off to the selected distributions bootloader, I don’t see why it is needed. It is also doesn’t poll for newly inserted devices, so if you run the program and then insert a USB drive you have to rerun the application, which is annoying. It also detected my floppy drive, which isn’t a USB device. Now being a programmer I can hazard a guess as to why, and I can only call that sloppy programming. The option to show all the drives in the system strikes me as odd for two reasons. Firstly, this is only supposed to be used with USB devices, and, secondly, said option would allow the user to select their PC’s main boot device. A simple slip of the hand and you could very easily screw up your perfectly working machine and lose all your data in the process. It seems to me like this “feature” was added just for the sake of it, and the developer then has the balls to include an EULA with a disclaimer saying any loss of data or any damage is not his/her/their responsibility. Not a very smart move. So would I recommend this? In a word: No. It’s a nice idea and in parts it is reasonably well executed but the combination of some strange – and unconfigurable – device setup choices and the frankly blatant disregard for the safety of its user’s data in such a flippant, selfish, arrogant, and unnecessary way means YUMI gets a low overall score. There are better ways to configure a multi boot USB drive.